← So much to do…. This last few days I’ve been spending time in the greenhouse with my tomatoes….sad I know, but I enjoy watching them grow and anticipating the first fruits. Won’t be long now I hope! A great deal is said about growing tomatoes – they take pride of place on the show bench at the autumn plant and produce shows and there are growers across the country who pride themselves on the biggest, the roundest and the most perfect specimens, but for me tomatoes are one of the easiest fruits/vegetables and also one of the most tolerant and rewarding to grow. In Mediterranean countries tomatoes can grow like weeds they are so quick to germinate, and here with only a very little help you can have a great crop for not too much effort. Like potatoes, which they are related to, tomatoes came to this country following the colonisation of South America. The Spanish distributed them widely throughout their colonies – everywhere from the Caribbean to the Philippines, and they rapidly became a common part of the global diet. 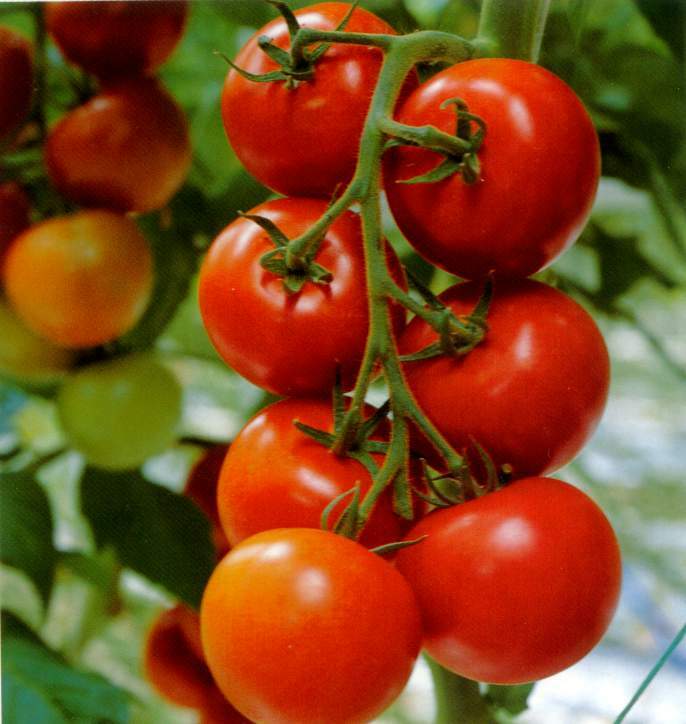 Remarkably there are around 7,500 varieties of tomato grown across the world, and so there is most definitely one for your garden or greenhouse! They come in almost every colour, size and flavour available to grow from seed, so think about what you like and where you will grow them and go from there. I always grow something easy and reliable and then something I’m not familiar with to add interest each year. This year I’ve got some Gardener’s Delight as my easy to grow type. They are cherry tomatoes and they grow almost too well. They need to be kept in check a bit though because they can become enormous. My dad always grew Moneymaker. They are a reliable and well known variety and I have fond memories of them, but this year I’ve chosen a beefsteak tomato. I love them and hopefully whether we get a great summer or not they’ll remind me of hot Mediterranean summers as they ripen. I haven’t really been successful with beg beef tomatoes in the past though. They become very heavy and so the plants need a lot of support and I’ve had blossom end rot as well so I’m going to be more careful if I can. Every year there seems to be a glut of fruit at the end of the season and so if I have lots of plum tomatoes I’ll be able to make and freeze masses of tomato sauce. And, of course, there has to be chutney which I can make with whatever else I have in abundance. So, back to growing. All varieties will respond to the same treatment to start them off and March is a good time to sow in a greenhouse or a light windowsill. Sprinkle the seed evenly over compost and put a layer of vermiculite over them or more compost in a fine layer. Then water and put a propagation lid over them, or a plastic bag, and let them germinate. As they come through take off the cover and keep them watered. Once they develop about 3 pairs of leaves they can be potted on into little individual pots. Plant them quite deeply and keep them in the greenhouse or indoors. For outdoor varieties you can harden them off from mid to late May by taking them outside every day and bringing them indoors at night until they are ready to be planted outside. I generally do this for a week or so. If the plants are to go into pots you need something big – at least 8-10 inches wide. Or they can go into growbags or direct into the ground if they are going into the veg patch. When you do plant them on again make sure you plant them deeply. Tomatoes keep growing roots around the base of the plant and will be more stable if they are planted well into the soil or compost. Taller upright varieties will need support. Put a cane in each pot and tie the plants in as they develop. Some varieties will grow up to 4 or 5 ft high with no difficulty at all. They need regular feeding and watering to make sure they develop well. Water every day, you can use up to half a watering can per plant, and feed with tomato food once a week or you could use my homemade nettle goo! More of that another day I think. If they’re in the greenhouse make sure you water and check the plants often because, especially in the summer, the heat can dry them out quickly. If you’re growing a bush variety in pots and baskets they don’t need much aftercare. 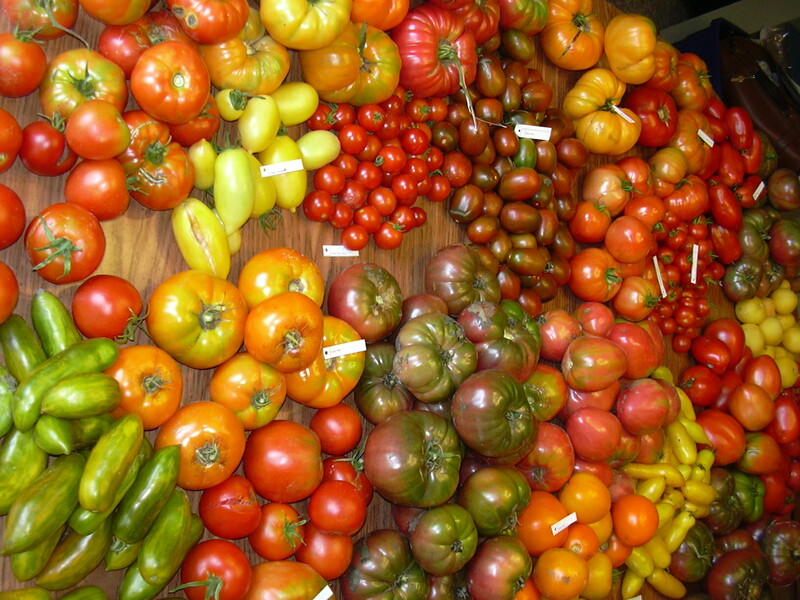 But the majority of tomato varieties will need pinching out and stopping. As the plant grows the flowers appear in trusses which will develop into the fruit. In between the branches at this time the plant will try to produce extra side shoots and they need to be pinched out so that the plant can concentrate its efforts on developing the fruit and not producing lots and lots of leafy growth. Keep going back and doing this regularly because the plant is just programmed to keep producing these side shoots. Then once the plant has about 7 trusses you should stop the plant by pinching out the top of the plant. Depending on what you’ve chosen to grow you should be ready to harvest from August and well into the autumn. My biggest problem is always blight and I’m convinced it’s our wetter summers that are to blame. Blight is especially a problem for greenhouse grown tomatoes where the warm and damp can encourage its development, and once it gets going it will develop quickly. The first signs will be brown marks on the leaves, which will spread to the fruit. Make sure you get plenty of ventilation in the greenhouse and if you see anything at all that looks suspiciously like blight remove it as soon as you spot it. Get rid of the diseased plant material by burning or binning, but don’t keep in on your plot. Good housekeeping is your best weapon in the battle against blight and so at the end of the season clean the greenhouse as well as you can so that you get rid of as many spores as possible. If you do get blight a spell of dry weather may well mean that otherwise healthy plants will rally and carry on to develop good fruit for the rest of the season. White fly and aphids can also be a pest. I prefer not to spray my plants and so I usually try companion planting. Buy a tray of tagetes (French marigolds) and grow them alongside. I grow basil and spring onions in the greenhouse beside the tomatoes as well. 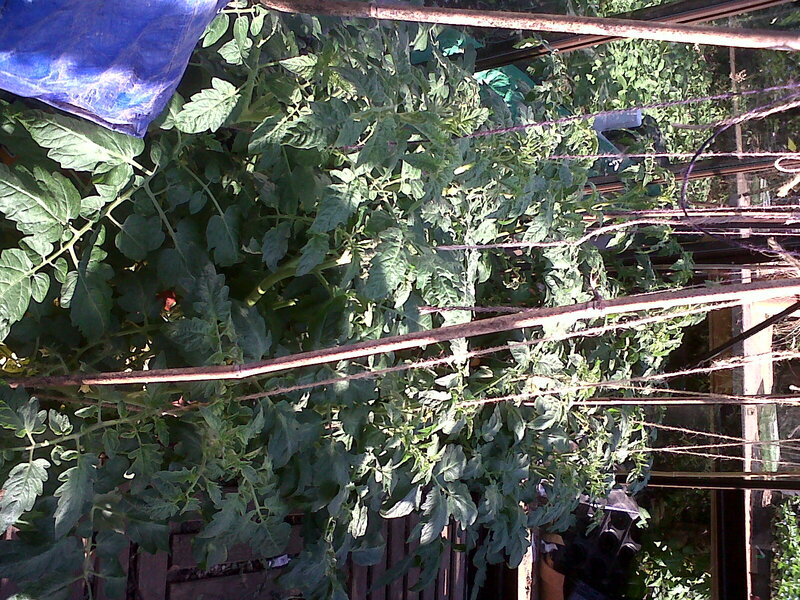 This way you’ll deter pests that attack tomatoes and get a crop of basil and spring onions into the bargain. Onions or any allium will put off all aphids, slugs and snails, marigolds repel aphids and whitefly and the basil is supposed to improve the flavour of the tomatoes and it certainly goes well with them in a salad! Having said all that I’d better get watering and feeding I guess.